Translation, or decoding, of the four-nucleotide language of DNA and mRNA into the 20–amino acid language of proteins requires tRNAs and enzymes called aminoacyl-tRNA synthetases. To participate in protein synthesis, a tRNA molecule must become chemically linked to a particular amino acid via a high-energy bond, forming an aminoacyl-tRNA; the anticodon in the tRNA then base-pairs with a codon in mRNA so that the activated amino acid can be added to the growing polypeptide chain. Some 30–40 different tRNAs have been identified in bacterial cells and as many as 50–100 in animal and plant cells. Thus the number of tRNAs in most cells is more than the number of amino acids used in protein synthesis (20) and also differs from the number of amino acid codons in the genetic code (61). Consequently, many amino acids have more than one tRNA to which they can attach ; in addition, many tRNAs can pair with more than one codon. 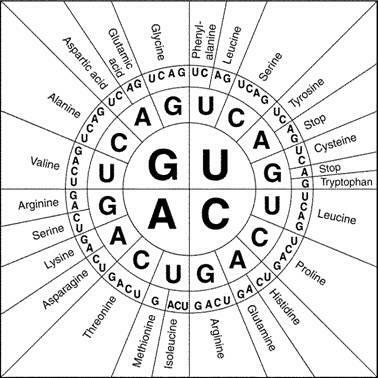 If perfect Watson-Crick base pairing were demanded between codons and anticodons, cells would have to contain exactly 61 different tRNA species, one for each codon that specifies an amino acid. As noted above, however, many cells contain fewer than 61 tRNAs. 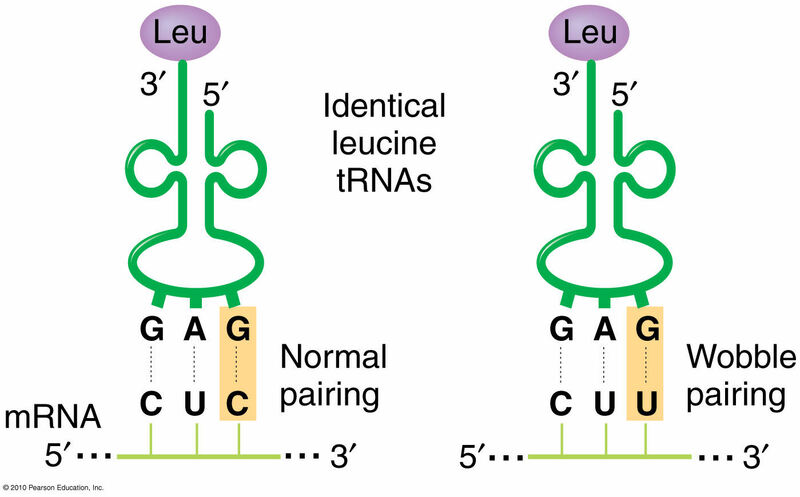 What is the explanation for the smaller number of tRNA than codons codons? In the table Cricks predictions are compared to the pairings found in experiments. Watson-Crick base pairing can be violated by wobble base pairing. The 5' of the anticodon has more freedom in binding, that is why, for many amino acids, the last part of the codon has more possible characters. Not the answer you're looking for? Browse other questions tagged biochemistry rna amino-acids or ask your own question.